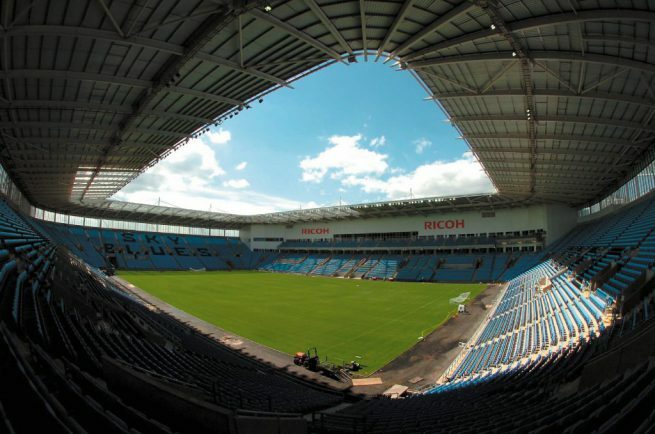 EXCITEMENT is building around the city as rugby league comes to the Ricoh Arena for the very first time next month. The rise of the sport in the city and the West Midlands continues with Coventry Bears set to play at the 32,500 seater venue when they take on Keighley Cougars in the Kingstone Press League One. In a bid to promote the game, the Bears and Wasps have agreed a reduced ticket price of £10 for adults and £5 for concessions, while under-12s, Wasps season members and Coventry Rugby Club members are free to attend in a bid to increase rugby league’s popularity in the area. In addition, all match ticket holders will have a further opportunity to watch the Bears for a reduced price when they play Doncaster the following week at the Butts Park Arena. “This is a fantastic opportunity for us to showcase rugby league and what the Bears are all about to fans across the city,” said Bears manager directer Alan Robinson. “We have some fantastic community projects underway at the moment and hope that everyone will get behind us as we take on one of the top clubs in League One. The Bears currently sit 13th in the Kingstone Press League One having won one of their opening four matches. It is only the club’s second season in the league having made the step up to the professional ranks last year. General admission tickets are priced at 10 for adults, £5 for concessions and young adults (12-16 years), while under 12s go free of charge. Tickets are available to buy at www.ricoharena.com. Wasps season members can claim their free ticket by emailing ticketoffice@ricoharena.com and Coventry Rugby Club members should call 02476 231001 or email enquiries@coventryrfc.co.uk. To gain £5 entry for the Bears’ match at home to Doncaster on April 14 simply keep hold of your ticket and show bring it to the Butts Park Arena on the day.